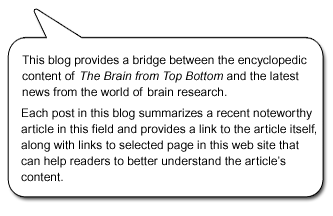 The subject this week is the sub-topic How Memory Works, under the topic Memory and the Brain. Research on human memory is such an important aspect of cognitive neuroscience today that the number of links on this topic on the Internet is enormous. I have therefore divided my selected links into two groups; I am posting 11 links here this week and will post another 11 next week. Biochemical changes in the brain that are associated with NMDA receptors and that occur only when you are asleep explain why sleep promotes the formation of memories. Eric R. Kandel, whose own research focuses on the cellular bases of learning, summarizes the highlights of the past 40 years of research on the biology of memory. A documentary about some spectacular cases of neuroplasticity, where people regained functions that they had lost as the result of brain injuries. Using a mechanical grabber that extended the reach of their arms by 40 cm caused experimental subjects to overestimate the length of their arms afterward. This finding implies that the plasticity of our body schema extends to its morphological properties. Improving your working memory by training it causes major changes in the density of D1 dopamine receptors in the frontal and parietal cortex of your brain. An experiment suggests that difficulty in remembering things may be attributable not to problems of memory storage, but rather to problems of memory retrieval that increase as we age. Runners who have just completed a marathon show a higher level of stress hormone (cortisol) and a decline in explicit memory, but an improvement in implicit memory. The comments that some marathon runners have made about this post are also interesting. Video of a course lecture by Professor Paul Bloom, of Yale University, on the different types of memory, their limitations, strategies for improving memory, memory disorders, and other related subjects. Steve Perrin’s thoughts on what motivates us to learn, inspired by Daniel J. Levitin’s report on widespread findings that it takes about 10Â 000 hours of practice to become an expert in anything. Data support Unsworth and Engle’s theory that working memory consists of a primary memory system and a secondary memory system, which contrasts with more traditional models of working memory, such as the influential model proposed by Baddeley.